iTunes really enriches our life by providing numerous music, movies, and TV shows for purchase or subscription at very low cost. However, the buying or rented items only come in decrypted M4V file type, which stick you only to Apple series products like iPod, iPhone, iPad, etc for playback on the go. That's not fair. To make your M4V files more applicable in daily life, i.e. playing them on a variety of media players, video editing programs, or portable gadgets, you can convert M4V to a widely used video format like MPG. MPG is a cross-platform video format, you can freely enjoy them no matter you're using PC or Mac system. The best part is you can enjoy the wide screen and sharp image when open them on HDTV, or easily burn them to DVD for playback on your regular DVD players. Thus, converting your M4V to MPG files, you'll enjoy a more colorful digital life. 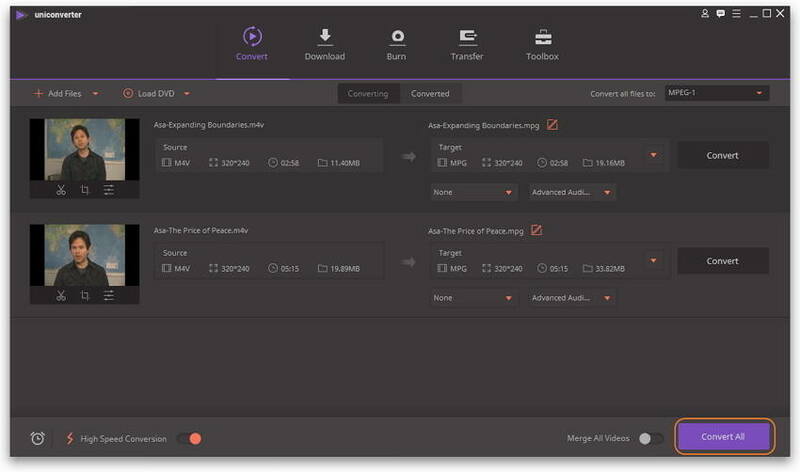 Here, an impressive and intuitive Video Converter (Video Converter for Mac)is introduced to help you complete the conversion task quickly and easily, no sweat! Step 1 Import M4V files to the M4V to MPG converter. 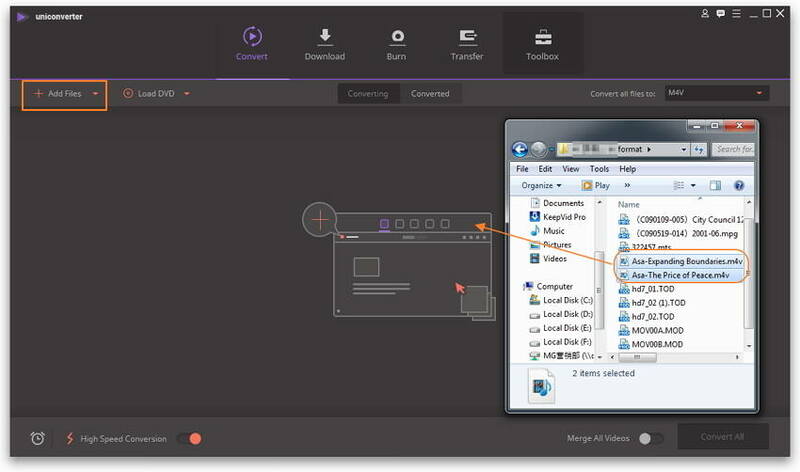 Run the video converter, and directly drag your M4V video from your file folders to the main window; or click the Add Files button to choose the files you want to convert. Step 2 Set Output format as MPG. In the Output Format pane which enters by clicking the inverted triangle beside Convert all files to, choose Video > MPEG in the output format list as your output format. After that, you can select the detailed resolution. Tips: if you plan to play the converted files on HDTV or portable device, you can adjust appropriate setting for both video and audio, including bit rate, encoder, frame rate, resolution, etc. 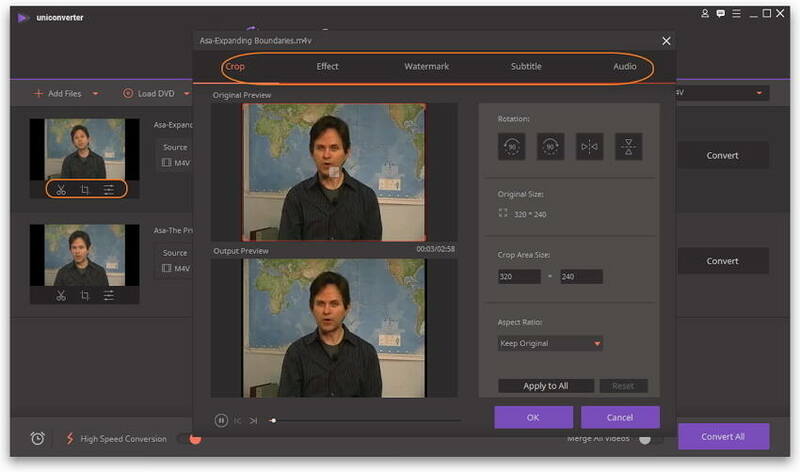 Step 3 Personalize your output videos. Step 4 Start converting M4V to MPG. Click Convert All button, and then the rest of M4V to MPG conversion task would be finished automatically. This smart program is very efficient, and the progress bar will show you the remaining time. 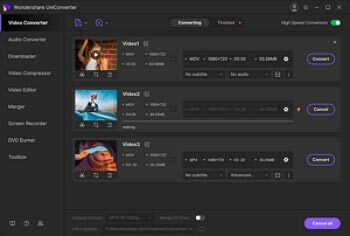 With this professional video converter, you'll find it pretty easy to transfer videos from or to any video format, so that you can enjoy a more colorful digital life. Start now!